Terrybly Densiliss Foundation: This is the most expensive foundation in my collection but I can safely say that it's worth the money for the airbrushed look it gives my skin. The coverage is pretty full, yet it doesn't look or feel heavy. It glides over pores and fine lines to give skin a filtered look and lasts for a good 9/10 hours without fading or breaking down. The finish is luminous rather than glowy, which is very flattering on the skin. It contains 'mimetic factor' which is designed to encourage collagen production and more elasticity in the skin so it's a clever skincare-makeup hybrid product. Compact-Expert Dual Powder in Apricot Glow: This is a dual powder/highlight - the powders can be used separately to mattify certain areas of the skin and highlight others. I personally like to swirl my brush around both powders in the pan and apply all over my cheeks for a soft focus, glowing finish. 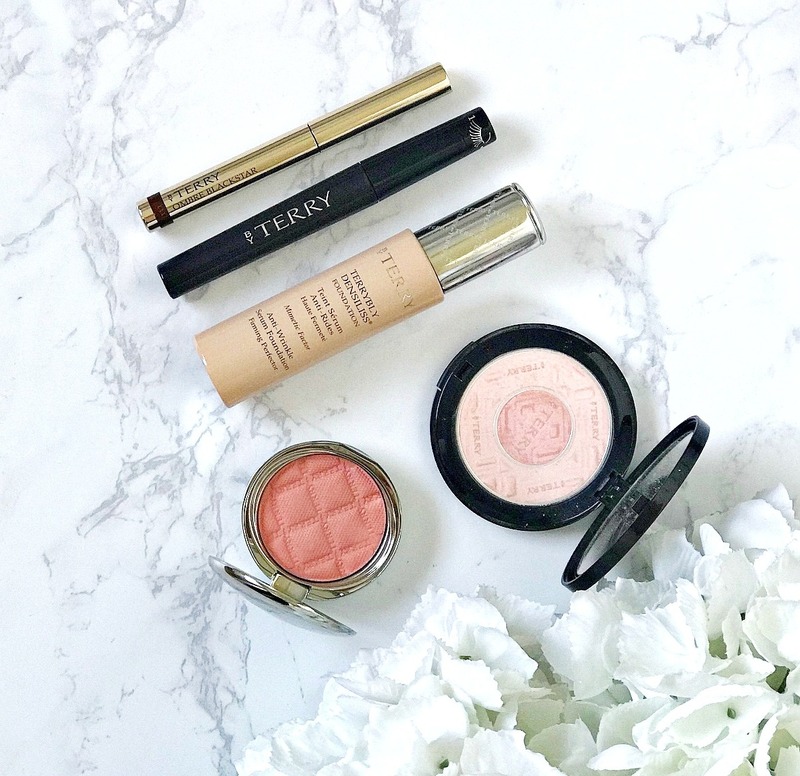 Terrybly Densiliss Blush in Platinum Blonde: This blush is housed in a weighty compact that also has a velvet pouch. You know that a product is bougie when it has a velvet pouch but I usually disregard them after a while! This is the crème de la crème of blush formulas - soft and velvety, it just blends into the cheeks so well and doesn't highlight any textured or porous areas. It's also very long-lasting and this particular shade is very flattering on my medium skin. Ombré Blackstar: The original cream shadow sticks! These were so hyped around 4/5 years ago and with good reason. They are so creamy and easy to apply and also have great pigmentation. The perfect product to use when you want to look put together but have approximately 10 seconds available to do your eye makeup! I have oily lids so I have to use a primer, but once I do, they last well. They also make a great base for powder shadows. Lash-Expert Twist Brush: I love this mascara because I can use the brush to give my lashes length and definition, then twist it to add volume. The formula is perfect - non-smudgy but it also doesn't make my lashes feel crispy. It doesn't flake and is easy to remove. An all round winner! Are you a fan of this brand? What's your favourite product? I'd love to hear! Available from Cult Beauty, Feel Unique, Look Fantastic, Arnotts and Space NK.